I am a little upset with the weather this week. We were enjoying beautiful fall days and then all of a sudden, BOOM. Winter decides to make an appearance. It is still October. I am not ready to see the white stuff falling from the sky. And I am especially not ready to drive in the snow and shovel the driveway. Ok, I really don’t shovel the driveway. Luckily, Josh loves the snow and takes care of that chore. I am still not happy though. The only good thing about the snow is staying indoors and warming up with tasty food. I made a big pot of Vegetable Quinoa Soup and Cheddar Rosemary Corn Muffins. 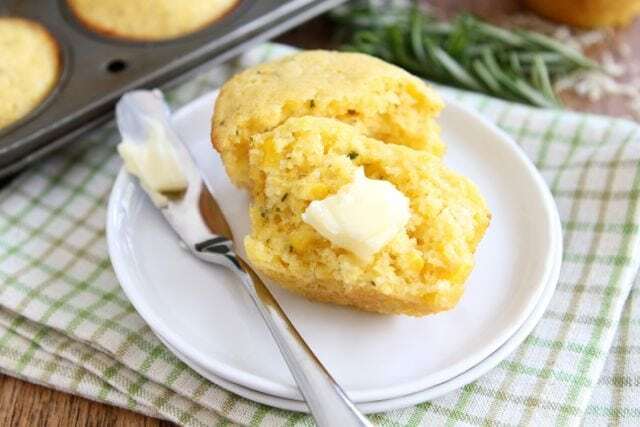 The Cheddar Rosemary Corn Muffins were the perfect side dish to our hearty soup. I love making corn muffins because they are so easy. You don’t have to mess with yeast and they only take about 15 minutes to bake. Plus, you only need two bowls-one for the dry ingredients (Gold Medal flour, cornmeal, baking powder, etc.) and one for the liquid ingredients (buttermilk, eggs, oil, etc). Combine both and you have corn muffin batter from scratch in no time. No box mixes needed! I did kick these corn muffins up a notch. I brought our rosemary in before it snowed and saw it sitting in the windowsill. I thought it would be a great addition to the corn muffins. I also shredded some white cheddar cheese to toss in. Suddenly, 15 minutes seemed like an eternity. I was soooo anxious to taste a corn muffin! As soon as the muffins were done baking, I pulled one apart and gave Josh half. Caleb saw us eating the corn muffin and crawled over as fast as he could for a taste. I gave him a little bite and he loved it. 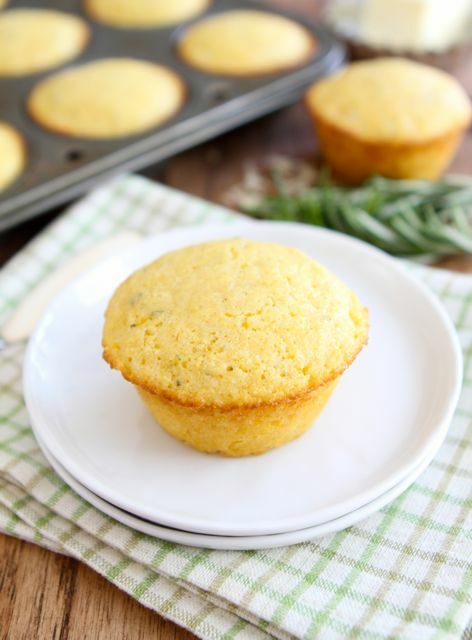 Easy corn muffins jazzed up with fresh rosemary and cheddar cheese! 1. Preheat the oven to 400 degrees F. Fill a regular-size muffin pan with paper muffin cups or spray with cooking spray. Set aside. 2. In a large bowl, whisk together the flour, cornmeal, sugar, baking powder, baking soda, salt, and fresh rosemary. Set aside. 3. In a medium bowl, whisk together the buttermilk, melted butter, oil, and eggs until well blended. Pour the liquid ingredients over the dry ingredients and mix with a rubber spatula until combined. 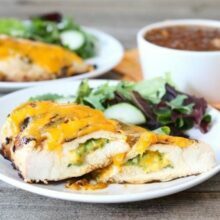 Fold in the corn and cheddar cheese. Divide the batter evenly among the muffin cups. 4. Bake for 15 minutes, or until the tops are golden and a toothpick inserted into the center of the muffins comes out clean. Transfer the pan to a rack and cool for 5 minutes. Remove muffins from pan and serve. Note-we used white cheddar cheese, but feel free to use your favorite cheddar. This post is in partnership with Gold Medal Flour, but our opinions are our own. We love Gold Medal Flour. Check out our Farm to Table Event in Kansas City with Gold Medal Flour. Mmm, corn muffins, soup, and snow sounds lovely. I’m sorry that fall left so quickly for you guys, but enjoy that snow – I’d love a bit of snow right about now! Yummy! I love corn muffins! I haven’t made them in so long! 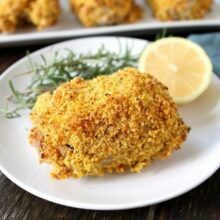 I need to make these, they would go perfect with tonights dinner!!! Ok, I have a silly question…You have frozen corn kernels as one of the ingredients, but in the instructions it doesn’t say when to add them in. I’m assuming with the cheese? These muffins sound so good. I think they’d be good with chili or another bean dish as well as your soup. Gotta try these soon. Yes, add the corn with the cheese. Sorry about that! I updated the recipe. Enjoy the muffins. I have the same question as Norma! This recipe came at a perfect time because I have buttermilk to use up! I’m not ready for winter yet either. I hope this impending east coast storm isn’t as bad as some predictions! These muffins sound wonderful. I have the same question as Norma! 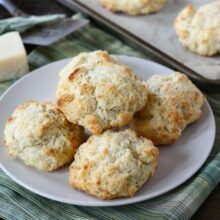 This recipe came at the perfect time because I have some buttermilk to use up! Thanks for catching that. Yes, fold in the corn with the cheese. I updated the recipe! That snow really caught me off-guard, too. I’m not ready for winter! Rosemary & cheddar are such a fantastic combination together. These sound great Maria! Corn muffins are one of my faves, love the way your jazzed them up! I really, really love corn bread/muffins. These look fab! In Peru, it’s not common to have this kind of muffins, you know, not sweet muffins, we always see on TV corn muffins but we just don’t bake. But a couple of days ago, one of my followers asked me for this kind of muffins, so if you don’t mind, I will try to make a Peruvian version of it. Oh my gosh….those sound AMAZING!!!!! PS…send some of that cold down south! 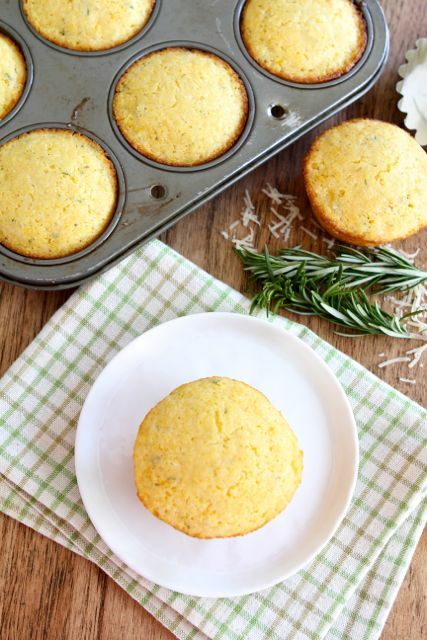 Love the addition of rosemary in corn muffins, sounds great! i’m in love with the addition of rosemary! These look so great. 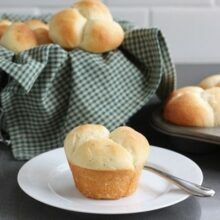 I am always looking for new savory muffins and breads for winter soup! I feel the same way…we got the snow in Colorado right after you guys did, and it’s brutal. I’m not ready. Bring back the warm temps and the sun…although the weather is a great excuse to make these muffins. They look great! I woke up to snow in Colorado this morning, I am not ready for it! Tomorrow and this weekend is supposed to be in the 60’s, so it will disappear, but it is just a reminder of what is to come! Love these muffins, the rosemary is a great addition! Love these muffins. They’d sure warm me up! Luckily, we all have your cheddar rosemary corn muffins to partake in while watching the snow fall outside..
A question about the rosemary. I also have my rosemary outside and thought about bringing it in. It is a medium-large pot though so wouldn’t fit in the windowsill. Do you have any suggestions about what I could do? Split it into smaller pots? 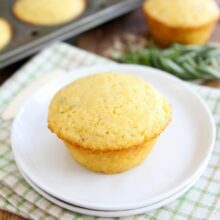 I’ve never thought of adding rosemary to corn muffins! I have definitely added cheddar though, and I know that’s a winner 🙂 Sounds delish! These are amazing! Nothing like rosemary! Giiiiirl, yes. I JUST made some last week with goat cheese. But cheddar? Killing me softly. These muffins sound sublime! I’m all about tossing rosemary into just about anything. I LOVE the sweet/savory combo in these muffins! I LOVE this rosemary infusion! What a great fall meal you made to accompany these! I immediately zoom in to every recipe I can find using rosemary. I’m addicted, I can’t help it. Then the addition of cheese here… wow. I had no idea corn muffins were so easy! I don’t usally crave corn bread but with rosemary in it… that’s a different story! I brought my rosemary in too! It’s in a vase along our window, LOVE smelling it everyday. Our weather has taken a drastic turn too. I love autumn, but I’m afraid we are getting much closer to winter too quickly! I will say it is perfect for cornbread though. I love the idea of the cheddar and rosemary together. Yum! Totally yum! I could go for a bowl of that soup with a side of these muffins! Both Looks & Sounds right up my alley. That’ time of year, ya know. love the idea of rosemary in the muffins! My husband and I were just talking about needing a “cornbread” to go along with the chili he is making on Saturday and HERE we go!! I made these last night, and they were delicious! Just the right amount of sweet and savory. Made these tonight to go with chili. A huge hit! I made them into mini muffins and our two year old loved them. You mean “coarse,” of course. That sounds good. I am trying to eat vegan though. Do you know good substitutions for the buttermilk and eggs? Will these muffins still come out if I omit the fresh/frozen corn? I love corn muffins, but not with actual corn kernels. Strange but true :)! Thanks! I finally got around to making these and am so happy I did! They’re amazing :)! I omitted the corn because I’m not a fan, and they came out just fine. I’ll be making these again and again!